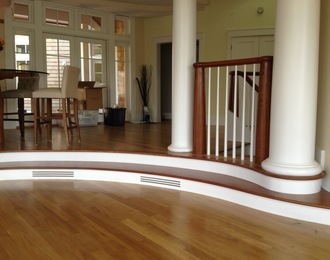 Anderson Stair and Railing is one of the leading staircase manufacturers in Connecticut. We have been steadily growing and satisfying the architectural building industry for years. Many of our clients are builders, however, we also serve a great percentage of private residents as well. Our specialty is custom stair work and our reputation for fine detail has awarded us the highest recognition as a leader in the design and manufacture of curved and straight staircases. Please check out the Photo Gallery links on our Home page and browse the many staircase samples from our satisfied customers. 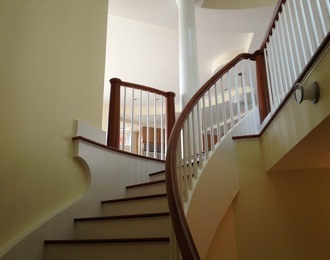 Let us help you make the staircase you’ve been dreaming about a reality! Anderson Stair and Railing prides themselves on crafting only high quality products that they install themselves. They do not use sub contractors. Every project is individualized with a wide scope of options available from a straight box stair to curved, circle stairs and railings. Our stair materials are all American-made. We work with numerous types of materials to provide you with a unique product that you can be proud of. Our team consists of skilled craftsmen that are focused on delivering your project on time and on budget while working alongside other professionals such as architects, builders and designers. 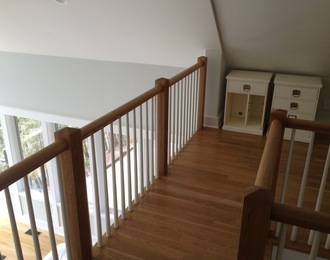 Our finished custom-built staircase and railing will add beauty to your home. It will be one you can rely on for years to come. Give us a call today for your free estimate, we look forward to hearing from you!